Coralie Balmy leads the French women with one automatic and two complementary events for Rio at the conclusion of the 2016 French Elite Nationals. 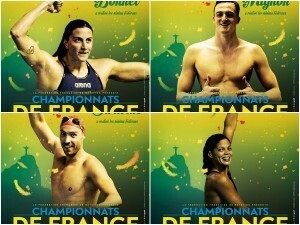 It’s Day 5 of 2015 French Elite Nationals and Olympic Trials and Camille Lacourt, Damien Joly, and Lara Grangeon are all hoping to see their own Rio posters at the end of the night. Defending champion Jordan Coelho (Stade de Vanves/Antibes) has been training with French record-holder Frack Esposito in Antibes for just six months; Esposito has a longer-term view for the young butterflier and was only hoping for a personal best in this race. Coelho came within .02 of making that happen; he won the race with 1:56.49. Paul Lemaire of Dauphins Toulouse OEC took it out with Coelho, turning first at the 100, about 1/10 ahead of the defending champion. At the end the two finished in the same order as last year as Lemaire took second in 1:58.17. Lemaire’s teammate, 19-year-old Matthias Marsau, registered a personal-best 1:58.45 and placed third. The rest of the A final consisted of Marvin Maisonneuve (Montauban Natation) in 1:59.44, Nans Roch of St-Germain-en-Laye/Paris INSEP (2:01.99), Romain Mrowinski of Cévennes Alès (2:03.72), Julien Pinon of Canet 66 (2:03.97), and Thomas Vilaceca of Montauban (2:06.34). Lara Grangeon of Calédoniens/Font-Romeu won her second event of the meet with, once again, a lifetime-best. Yet for the second time she missed the very difficult French standard for making the Rio team. Grangeon went right out, wasting no time to get ahead of the field. She was 1:01.4 at the 100, with Nice’s Marie Wattel on her heels. Grangeon came home in a strong 1:06.4, making for a winning time of 2:07.87 but missing the cut by 1.25 seconds. Wattel, meanwhile, had a very difficult finish and wound up third in 2:11.82. Kelsi Worrell’s back half took her past Wattel, as she touched in 2:10.45 for the second time overall. After the leaders came several waves of finishers. Camille Wishaupt of Mulhouse (2:13.69) was fourth, followed by Morgan Rothon of Dijon (2:15.97), Gwladys Larzul of Dauphins Toulouse (2:16.83), Morgane Filippi of ASPTT Montpellier (2:17.91), and Charlyne Secrestat of Clamart/Paris INSEP (2:18.43). Benjamin Stasiulis of Marseille successfully defended his 2015 title with a dominant 1:58.48. He was .03 off his winning time from last year and clearly disappointed with his swim. In the post-race interview he admitted he expected at least to make the FINA A standard. Geoffroy Mathieu of Clermont Natation claimed the silver medal in 2:00.03, a personal best by 1.7 seconds. The third step of the podium belonged to Maxence Orange of Nantes with 2:01.03, erasing 2.2 seconds off his previous personal best. Christophe Brun of Dauphins Toulouse dropped nearly 2 seconds and earned a fourth-place finish with 2:01.36. Oleg Garasymovytch of CN Avignon took fifth in 2:02.49. Simon Brefuel of Canet 66/Font-Romeu notched a PB with his sixth-place finish of 2:03.72. Simon Lesaffre of Roubaix Natation (2:04.78) and Baptiste Leger of ES Massy (2:06.15) rounded out the A final. 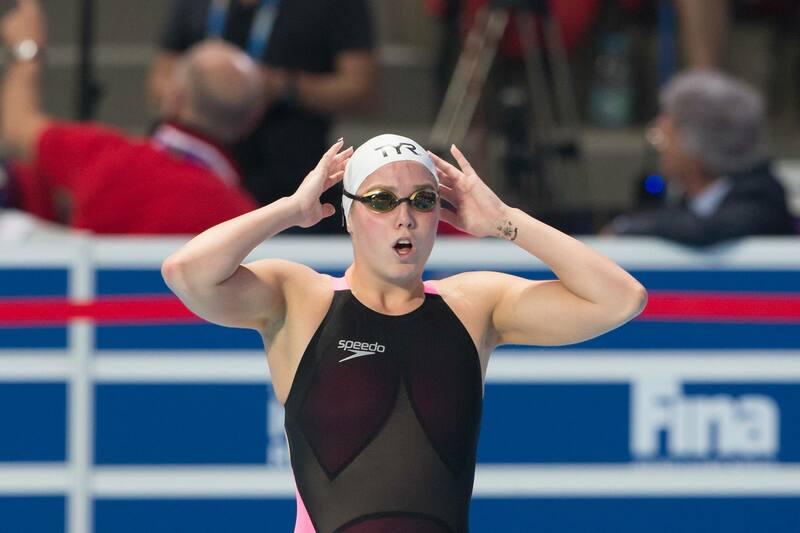 After the automatic qualification by Coralie Balmy in the 400 free and the French national record by Lara Grangeon in the 400 IM, the brightest spot in the women’s meet so far was the 50 free, which was across-the-board fast. Defending champion Anna Santamans of Olympic Nice explosed off the blocks and swam an excellent 50, going a personal-best 24.59 for the win. Santamans was only 1/100 off the French national record and 2/100 away from the Rio cut, which only this morning had seemed far out of reach for the Niçoise. Santamans admitted feeling out of sorts in prelims, but she pulled it all together in finals and put herself in an excellent position to be chosen for the Rio team. Kelsi Worrell finished second in 25.06, a touch off her 24.98 time from prelims, which was a personal best. Third place went to Mélanie Henique of Amiens/Marseille in 25.13, her best time by .26. Marseille’s Béryl Gastaldello touched fourth in 25.33, her best by .08. Mathilde Cini of Valence Triathlon/Marseille clocked a 25.40 for fifth, another Frenchwoman with a best time as she dropped .14 off her seed time. Lena Bousquin of Bordeaux Bastide (25.41), Anouchka Martin of Marseille (PB of 25.51), and Lauriane Haag of Toulouse (25.57) comprised the rest of the fast final. Defending champion Nicolas D’Oriano of Dauphins Toulouse relied on a strong back half to win the 400 IM again; this time he went a personal-best 4:20.03, 2.5 seconds faster than last year. His teammate Geoffrey Renard and Tunisia’s Ahmed Mathlouthi, who trains at Sarcelles Natation, led the field over the first half of the race. Anthony Pannier, also of Sarcelles Natation, overtook Renard on the freestyle leg, and the order at the finish was D’Oriano, Mathlouthi (4:22.42), Pannier (4:23.94), and Renard (4:24.95). Each of the top four finishers registered a personal best time. Cyril Chatron of Bron/Font-Romeu (4:25.80, best by 2.2), Yannick Chatelain of Nautic Club Nîmes (4:26.38), Samy Helmbacher of Dauphins Obernai (4:27.05, best by 4), and Mathis Castera of Dauphins Toulouse (4:28.96) rounded out the championship final. Any links to streams available in USA?? Seanswimmer, look for Bein Sports France 1 live streams on Google. Type “Bein Sports France 1 live streaming” on Google and you will find. Coehlo, Grangeon, Stasiulis, Santamans and D’Oriano are my favorites. Grangeon, Stasiulis and Santamans can qualify for Rio but it will be tough.